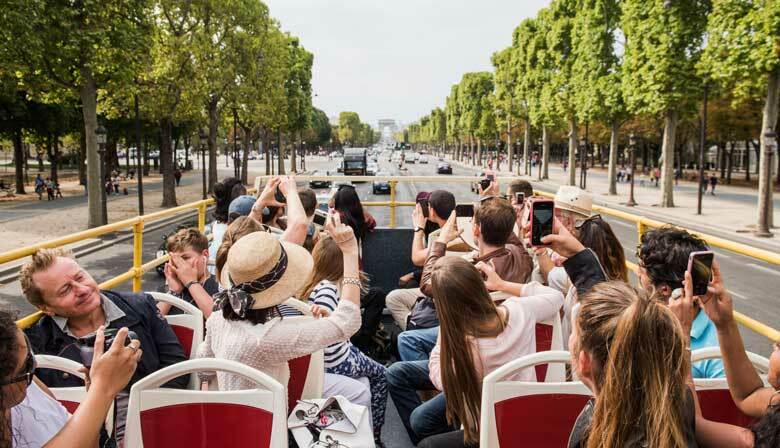 Take advantage of this one-day pass to discover Paris on a hop-on hop-off bus. Aboard a Big Bus sightseeing coach, you will explore the city while listening to the history of its iconic sites. This combo city tour also includes a dinner on the Seine aboard a La Marina boat, a perfect start to your evening. The two routes offered by Big Bus will provide a complete overview of Paris. The itinerary of one of the routes is focused on the most famous neighborhoods of the historical city center. You will be treated to a unique view of Paris landmarks while listening to a pre-recorded commentary in the language of your choice on personal headphones. Hop on and off easily at the places that interest you the most at any of the 10 stops on the route. You can choose to visit the beautiful Opéra Garnier, architectural splendor of the 19th century, or to shop in the famous Galeries Lafayette or even discover the magnificent church of La Madeleine, commissioned by Napoleon I to glorify his Great Army. You can also decide to tour the northern part of Paris by taking the "blue" route. This will allow you to experience the characteristic neighborhood of Montmartre. Stroll along the picturesque streets of Montmartre, visit the majestic Sacré-Coeur Basilica, pass in front of the Moulin Rouge known as the oldest cabaret in Paris, or explore the fascinating Pigalle district. One of the stops which is located near the Gare du Nord will allow you to stroll through the surrounding area. After having explored the city at your own pace, you'll certainly appreciate a fine gourmet dinner prepared by the chefs of La Marina. Go directly to Port Solférino, near the Musée d'Orsay, to board a charming boat-restaurant. Gliding along the water, you'll recognize the great landmarks bordering the Seine and experience the amazing views that unfold before your eyes. You'll enjoy a dinner that will offer you a chance to discover France's culinary richness. After enjoying a delightful cruise along the Seine while savoring a delicious dinner, you'll return to the Solférino port to end your evening in Paris. For security reasons, you must wait until the bus comes to a complete stop before getting on or off and it is strictly forbidden to lean against the railings of the vehicle. Your seatbelt must be fastened at all times when the bus is moving. A complimentary poncho will be provided in the case of rain. Out of respect for others, please do not throw anything inside or outside of the bus. The itinerary is subject to change without notice in the case of an unexpected demonstration or special events (for example: the July 14 National Holiday, the arrival of the Tour de France). The ticket is valid for one or two days, depending on the excursion chosen. No matter what time you start the tour, your ticket is valid for one or two days from the day you start the tour. You will receive confirmation of your tour reservation by email, along with a voucher. Print the voucher and present it when you board the La Marina, Port de Solférino.